NEW YORK - The Red Sox changing their starter on Sunday didn't have an effect on the Yankees' lineup for Game 3 of the American League Division Series; it's the same as Game 2's, because Aaron Hicks is once again out of the lineup, as a precaution, due to a tight right hamstring. "It was a really tough decision today; a lot easier the other day, frankly, because today I felt like he is considerably better in the way he was able to move around," Yankees manager Aaron Boone said. "(Strength and conditioning coach) Matt Krause was out there putting him through some extensive movements, and felt like I t was significantly better." Hicks didn't start but was available for Game 2, and that's the same tonight, too. "He was more emphatic about wanting to be in there tonight, and I just felt like, with the nature of hamstrings sometimes, and what his legs mean to being a center fielder, and the fact that we have Brett Gardner as an option, I just really felt like not starting him tonight is hopefully something that benefits him even further," Boone said. "That said, he is an active player for us. I wouldn't hesitate to use him, not just as a pinch-hitter, but putting him in the game defensively and feeling he's ready to do that." The Yankees lineup will face Nathan Eovaldi, who has allowed just one unearned run over 16 innings against them since joining the Red Sox in July. Eovaldi tossed six shutout innings in the Bronx in September, and credit his resurgence to a change that has also worked for CC Sabathia. "I think his cutter this year has probably been the main reason," Hicks said Sunday night. "When he was here he didn't have that, he was more of a fastball-splitter guy; he throws that cutter from 88 to 94 (MPH); it's a big jump, and that's kind of something new for us that we've never seen him do before." Eovaldi has also limited home runs for the most part, but the Yankees have an idea about how they can deviate the right-hander from what has worked against them so far. "I think he was able to really execute his game plan," Boone said. "He has really good stuff obviously, and we've seen the cutter become a major factor for him this year to go along with that velocity, but I feel like he's had really good command against us and thrown the ball where he's wanted to. He'll be a challenge for us tonight, but I feel like we have a chance to be successful." Meanwhile, Luis Severino is on the mound for the Yankees, coming off a Wild Card Game outing where he went four-plus shutout innings. He's faced the Red Sox five times this year and posted a 3.36 ERA, but with that familiarity breeds adjustments that need to be made on both sides. "They have a good lineup, so I need to hit my spots, not make mistakes, and try to go deep in my game," the righty bluntly said. "I have to go in there with my good stuff and try to get as deep as I can. Last time, I went four innings, and this time, I want to try to get to seven and then let the bullpen do their job." 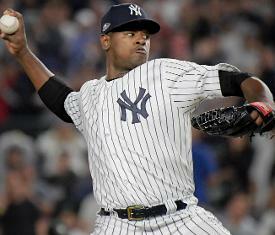 Last postseason, Severino struggled in the Wild Card Game but came back to have a strong outing in Game 4 of the ALDS. This year's Wild Card Game was obviously better, but the man who lines up behind him expects Sevy to go out and be that bulldog on the mound. "He doesn't change, he's always the same," CC Sabathia said of Sevy. "His demeanor is that of a guy who can be one of the best pitchers in this league. Nothing phases him; you see what happened to him earlier in his career, but he went to the bullpen and was great, and just being able to find himself now as one of the best pitchers in the league just tells you how hard he works and how strong he is mentally. I have all confidence in him going out tonight and pitching a good game." "I feel like some of the trials that he's gone through this year even more prepare him for these kinds of outings and these kinds of moments," Boone added of Severino. "The way he started to throw the ball the last couple times of the regular season, and then obviously against Oakland, I feel like he's in a really good place right now, and hopefully he can go out and set the tone for us tonight." It does all come down to execution in the end, but with the Yankees 7-0 at home in the postseason the last two years, there's hopefully a tangible boost to be had from tonight's capacity crowd. "I think everyone's witnessed the impact I think our crowd has had on things, and the Wild Card Game was a special environment," Boone said. "But, we know we're up against a great team, so we have to play well. We're excited to be home and hand the ball to Sevy, but it comes down to performance." -Gary Sanchez had a monster Game 2 and has been strong behind the plate, and here's Boone on the backstop's resurgence: "Defensively, he's been able to limit mistakes in the postseason, and I think he's been really sharp from behind the plate in all aspects. Offensively, I feel like the at-bats started to improve as he's controlled the strike zone a little bit better, and now all of a sudden, hopefully, a little bit of success kind of unleashes what is a massively talented offensive player. I know how difficult this year's been on him in a lot of ways, so for him to get some results was pretty cool to see." -Given the Yankees-Red Sox rivalry, much has been made of Severino's relationship with Pedro Martinez, and this is Sevy's take on how Pedro has helped him: "It's not about he's in Boston, and I'm a Yankee. In the off-season, we're humans. He's was a great pitcher, a Hall of Famer, so when somebody like that offers to help you, you don't say no. We've been working on a little bit of mechanics, hiding the ball and little details that he thought was a little out of balance and stuff like that, but that was it." -Severino also says that even in his struggles, his confidence was never rattled, because he doesn't take the term "ace" to heart: "I always say every starter is the ace on his days to pitch. And, I feel like in baseball, the second half is more important than the first half; I don't know why that is, but I always had confidence in myself. I know my struggle, and I know what it was that wasn't working that time. So I never lost my confidence in myself, and the last couple outings, I came back and did a better job." -Giancarlo Stanton is 3-for-13 in October, but much as he's handled all of this year's bumps, Boone is confident the slugger will come through this one: "I think he's totally equipped for this. With Giancarlo, the nature of sometimes when he doesn't get a hit or whatever, sometimes he doesn't look great necessarily doing it, but we also know he's always so close from being able to have a major impact in the game. But what he's shown me, without a shadow of a doubt this year, is that he is so equipped to handle the ups and the downs and the daily stuff that goes on. I know he'll be prepared, focused, in a good place, and give himself a chance to be really successful." -Last word is also from Boone, and it's this simple statement summing up the overall feel of the series: "These games with the Red Sox feel like a heavyweight fight. Nothing feels safe, or good enough, because you never know where these games are going to go. They're grueling to be a part of, but they're fun to be a part of, especially when both sides understand what the other side's capable of."